I had to pull out the internet searches for the last two issues of X-Men: Blue. With each new story arc, this series has gone from the easy and familiar entry point, provided by the younger time displaced X-Men, to deeper and deeper cuts from X-groups past. The changes started with alternate reality Wolverine’s son, and a vampiric Storm called Bloodstorm. These additions were fun and refreshing. From there the complications increased with alternate reality Marauders, secondary mutation villains, and of course our original younger X-Men in space with Venom. At first, these turn of events felt frustrating to ingest. I was genuinely upset about how complicated the story was becoming. While Cullen Bunn can be great with mysteries or twists, it wasn’t clear there was any deeper meaning or purpose on first reading. It felt very much like chaos and complicated plot for their own sake. What kept me hanging on, until the end, was tenuous yet building action in the art. This series is no longer the easy entry point it felt like, in the beginning. The reintroduction of the entity known as Malice (or an alternative reality version) last issue, strips what little was left of the easy access away. Originally the alternate reality characters provided opportunities for quick and clean exposition, on who characters were or what they meant to one another. Yet, that did not happen with Malice, which caused me to hit the internet search. The Malice/Polaris relationship is long and complicated. So much so, that I had to look at a timeline to refresh myself on what it was all about. 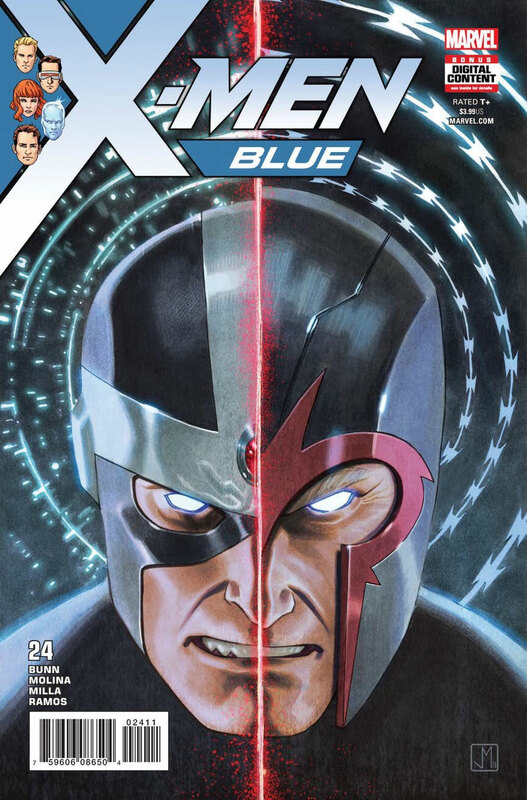 While, it was a fascinating story beat, it’s purpose seemed to be an unceremonious device to get the most fascinating member of the Raksha to join Magneto’s X-Men. Magneto’s X-Men… I don’t know if typing that will ever feel normal. The greatest compliment I can given Joe Caramanga’s lettering is that it blended in so well with the issue I didn’t think about it once. Molina’s faces, body styles, and details are varying and beautiful. Talking-head panels feature poses and talking hands which keep the back and forth fresh and not stagnate. Layouts feature bleeding of the page or into the gutters as well as overlap which also help keep the pace flowing and reading order clear. Milla & Ramos’s color work features lots of gradients and lighting effects which keep simple or no detail backgrounds dynamic. From Magneto, to Jimmy and Bloodstorm to Polaris and Malice, this was a an issue filled with lots of action sequences and confrontation. Readers who love those kinds of breakneck speeds will inhale Molina’s various takes on fighting sequences. There is a great change up in style between them. Magneto’s confrontation feels more like a traditional fight sequence. Jimmy & Bloodstorm are caught in a standoff that receives an artistic exclamation point through how Bloodstorm saves the day. Milla and Ramos’s colors help to make those panels stand out since the key tool in the rescue is solid black. This is taken a step further with the Polaris taken over by Malice fight scene which has the important and deadly portions played out in silhouette. The art plays a major role in creating rising action from more action. It also helps to bring a feeling of connectivity between the three events, even if you’re not sure what the purpose is, at that time. Bunn’s purpose, of course, is to build a new, or at least secondary, team for this series. I’m fine with this, since Jimmy, Bloodstorm, Gazing Nightshade, as well as a new surprising character, are more fascinating than the young X-Men. Fans of that original team might feel betrayed, as if they were given a bait-and-switch. For now I’m invested and will keep reading.